Sunken Scroll 17, describing Callie and Marie's childhoods in Calamari County. Calamari County (Calamari Region in the European version of Splatoon), or simply Calamari, is a location outside of Inkopolis. 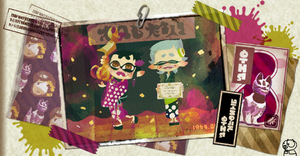 Calamari County is the hometown of Callie and Marie, the Squid Sisters. It hosts the annual Youth Folk-Singing Contest, which launched the singing duo into the spotlight. Although Calamari is never directly seen in Splatoon, it is referenced multiple times, most notably in Sunken Scroll 17 and an Inkopolis News segment regarding Port Mackerel. “ Callie: I love the salty sea air that wafts through here! Shiokara Chihō Shiokara Country. Shiokara is a Japanese dish made from fermented squid.